AnandTech Podcast #36: The annual smartphone extravaganza known as Mobile World Congress has come and gone. We clocked up 45.4km on foot during the week, averaging around five hours sleep and one meal a day to be able to see everyone of interest. Because so many interesting things were presented, from LG, Samsung, Huawei, Xiaomi and others, just before we left Barcelona Andrei and I put together a podcast of details, experience and analysis of the new devices. There are plenty of talking points with each of them, from a modular design to heatpipes to new silicon microarchitectures, and we recorded our initial impressions in a podcast. 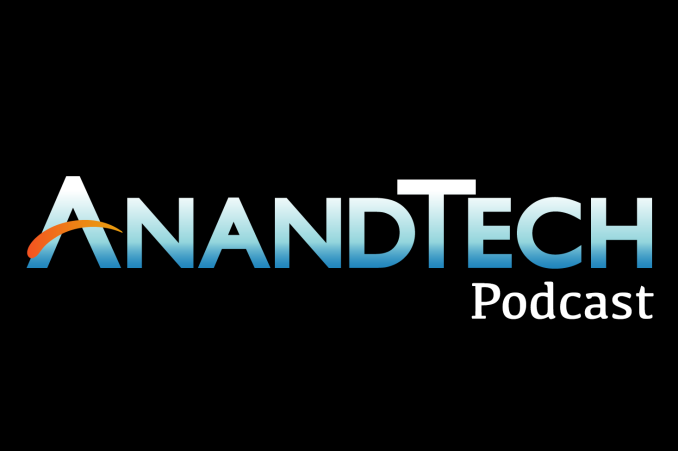 I had no idea Anandtech has a podcast! Or that my phone would allow me to keep listening to it from other tabs and apps. "We clocked up 45.4km on foot during the week, averaging around five hours sleep and one meal a day to be able to see everyone of interest." I'm not sold on LG's G5. Yes, it's metal now, but it's hideous. Seems like a step sideways, not forwards! And a 5.5" screen is still not something I'd touch. High impedance support on the upgraded DAC would be interesting. Not $180 interesting. Especially not with cans that'd cost as much as that accessory. This is my third MWC, and the last two years were just Andrei and I on the ground. Josh and Brandon are typically busy in the last week of February, plus Andrei and I are closest to the show anyway, being on the same continent at least so it doesn't cost an ARM and a leg to send us by comparison. For sure I'm not a smartphone reviewer by trade, but for the past few years I've covered all the launches that happen in the UK, I attend events like ARM's Tech Days on new microarchitectures because Cambridge is just up the road, Mediatek's Analyst Forum events always seem to be in London, and I have Imagination right around the corner. In that time I've written one full smartphone review and a couple of 'A month with' pieces, along with news over the years and things like our recent trip to Huawei in China. If I had to take on smartphones full time, I could argue that it's just a stones throw away from a lot of the CPU stuff I already do, just with a different focus on mobility that requires thought I haven't necessarily put into certain things. Having been in meetings with Anand at first then Andrei, I just listen in on the technical side and absorb information, but I also ask about more marketing/sales things like reach, response, research and market. At some of these events, I'm still there plowing questions to the PR/technical about the hardware to the bemusement of most tech press. I also play a role on the business side of things at these events, introducing new teams and contacts to who or what AnandTech is, describing our unique role in the ecosystem and how to build new bridges for different content on stuff we've either wanted to do for a while (e.g. Sony), or need to invest more resources in (e.g. Enterprise). I wear many hats. I'm sure if I wasn't already on the PC side, I'd happily pursue the smartphone space in a more permanent role, just as Ryan probably would. However we have three super awesome and super smart editors already going above and beyond, so I'm just happy to be a minor link in that chain when needed, such as UK launches, company relations and events like MWC. "Doesn't cost an ARM and a leg"
I am really worried about the Snapdragon 820 and it's prevalence. The 810 was mediocre and the 820 seems no different. Sammy's 7420 on the other hand is one helluva SoC (if charitably called lackluster in GPU performance) and it sold me on big.LITTLE configs.